Fungal disease belonging to the Basidiomycota group of fungi. Initial external signs are the dieback of leafy branches, foliage wilt, the foliage turning yellow in spring and a gummy liquid oozes from the bark at stem bases. 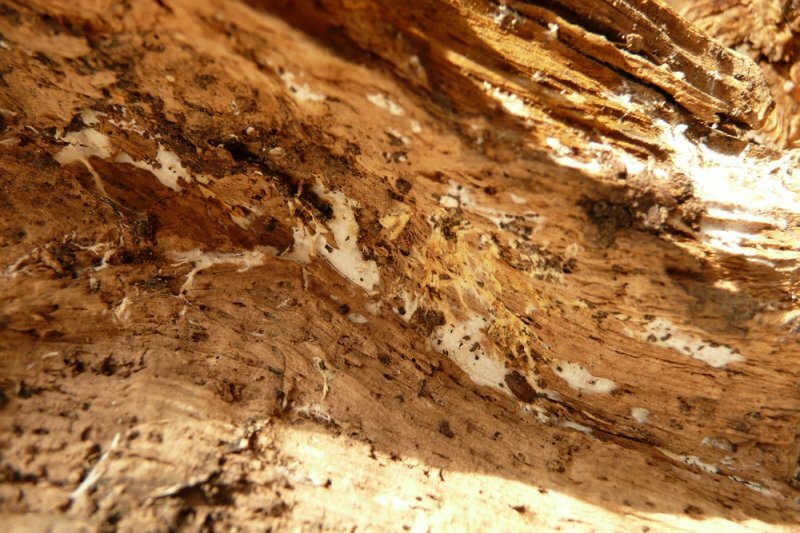 A layer of white mycelium (which smells of mushrooms) can be found underneath the bark (which may start to die off from the base). 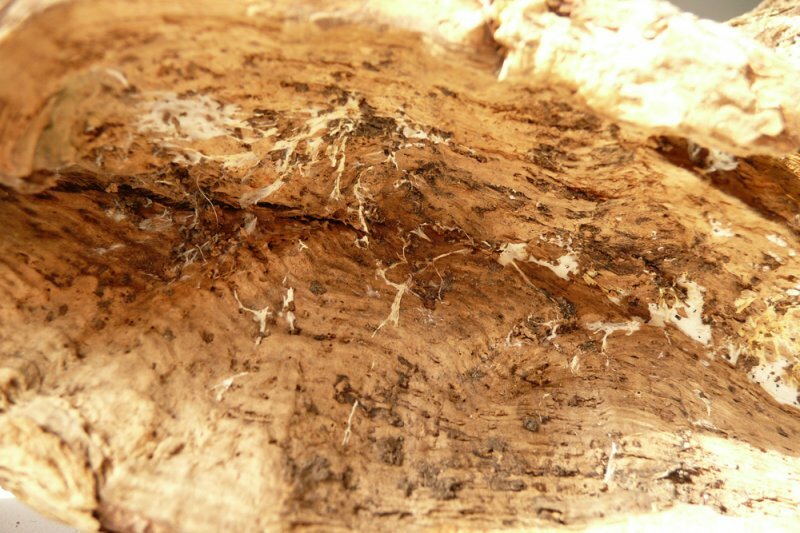 The mycelium can grow several metres high and is clearly visible when the bark is removed. Black ‘bootlace’ strands of fungal rhizomorphs can be seen spreading from the trunk (although these are usually underground). These rhizomorphs are the means of infection and can radiate out from the tree to up to 7 metres and a depth of 70cm. As the disease progresses, dense clumps of honey coloured toadstools on and at the base of the trunk in between July and December (although they can be killed off by frosts in the autumn). The toadstools are 15cm high and wide, and can have a greenish grey or pink tint. The gills are whitish becoming yellow with age and sometimes brown spotted. It should not be assumed that, if toadstools and rhizomorphs are present, it is due to this disease and evidence of other symptoms (ie within the tree) should be sought before action is taken. The white mycelium feeds from the tree’s phloem food transport system and will eventually prevent the plant from accessing any food from this supply. It will eventually kill the plant, although this could take from a few weeks to several years to happen, depending on the size and vigour of the plant. The infection can spread to infect other plants nearby, by the rhizomorphs infecting roots or spores spreading to fresh cuts from felling or pruning. Primarily attacks trees and shrubs such as apples (ornamental and edible), birch, cedar, cherry, contoneaster, cypress, false cypress, forsythia, hydrangea, leylandii, lilac, maples, pine, plum, privet, rhododendron, ribes, roses, thuja, walnut, willow and wisteria. Often attacks newly planted trees and shrubs, particularly those which are planted too deeply (as deep planting makes the plant initially less vigorous because the feeding roots are further away from the most nutritious topsoil level and the plant is therefore more open to infection). Ensure that newly planted trees and shrubs are carefully managed to promote vigorous growth. If you are concerned that honey fungus may have been present in your garden in the past you can select less susceptible trees and shrubs, such as box elder (Acer negundo), yew (Taxus baccata) which are both very resistant, or ash, bamboos, beech, box (Buxus sempervivans), catalpa, cercis, chaenomeles, clematis, cotinus, Douglas fir, eleagnus, fothergilla, hawthorn, holly, ivy, kerria, larch, laurel (Prunus laurocerasus), lime, liquidamber, Lonicera nitida, mahonia, oak, photinia, pieris, pittosporum, rhus, robinia, silver firs, sumach (Rhus typhina), tamarisk and tree of heaven. Removal of the diseased plant including the stump. Where the stump is large and difficult to remove, you can dig a trench to a depth of 70cm, loosen the soil with a fork and then apply a sterilant such as diluted formalin. But this can only be done in situations where you do not wish to grow on the soil for a period afterwards. Removed wood should be destroyed (eg burnt). Once removed, you may also wish to remove the surrounding soil to ensure that no rhizomorphs remain within it. The site should not be replanted with a woody plant for at least one year after removal of the infected stump and roots, to give the fungus a chance to die down. Where the source of the infection cannot be identified (it will be within 30m of the affected plant) and dealt with, then only more resistant plants should be grown in the area. If you wish to keep the infected plant as long as possible (they can survive for several years with the infection) then you must take action to prevent this transferring to uninfected plants. This can be done by digging a trench around the affected plant and filling it (eg with concrete) to prevent the spread of the rhizomorphs. However, this does not remove all risk of infection since the toadstools growing in the autumn will produce spores which can transfer the infection to other plants. Chemicals based on phenolic emulsions used to be available for use in dealing with honey fungus but are now only permissible for use as disinfectants.